This week's inspiration is all about the kitchen. Just the thought of moving everything to the wall and having a nice clean counter space makes me drool. However, at a scant 5'3", most of the ideas in this picture would be out of reach, and the step-stool would unfortunately win in the very contrived contest of winning new best-friend status. 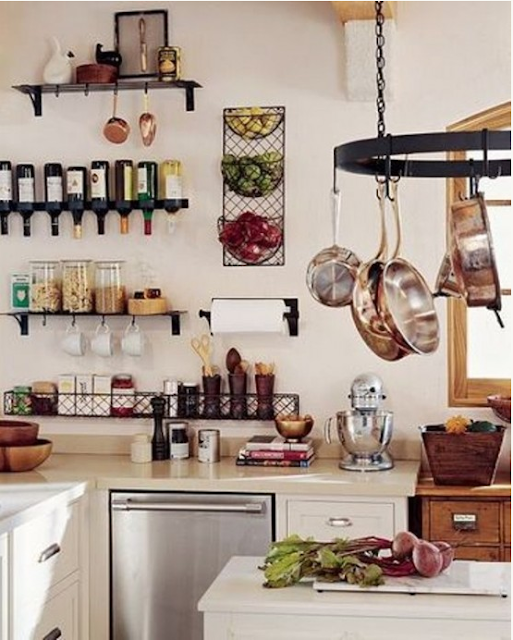 That being said, all these wall storage ideas are great - the fruit basket, the wine rack, the cannisters, the wooden spoons... all up and in their own space, even though the wire mesh is a bit on the industrial storage side. I even love how the wine rack keeps everything upside down and makes a design statement in the process of keeping those corks nice and moist.